My Phantasy for oboe and English horn will get its 14th performance at 1pm on August 18, 2015. It will be performed in the “ADRA The Wind from Asia” concert of IDRS (International Double Reed Society) 2015 Conference. The venus is Small Hall in the Arts Building of National Olympus Memorial Youth Center (3-1 Yoyogi Kamizono-cho, Shibuya-ku, Tokyo 151-0052, Japan). Thank Oboe Duo Agosto (Ling-Fei Kang and Charles Huang) for bringing this piece to Tokyo and thank Prof. Rong-Yi Liu to make this performance possible. I really appreciate and I am very much looking forward to it!! I am very thrilled that after 12 performances in the United States and Thailand my Phantasy for oboe and English horn will get its 13th performance on June 7, and at this time it will be the first time to be performed in my home country, Taiwan. I use a Taiwanese aboriginal (Atayal) tune in this piece, and at this time it will be back to the familiar place, which this original tune is sang and heard. Thank Oboe Duo Agosto for bringing this piece to their concert in Taiwan. The concert will be at 3pm on June 7, and the venue is Bratsche Arts Center in Hsinchu, Taiwan. Admission free!!! 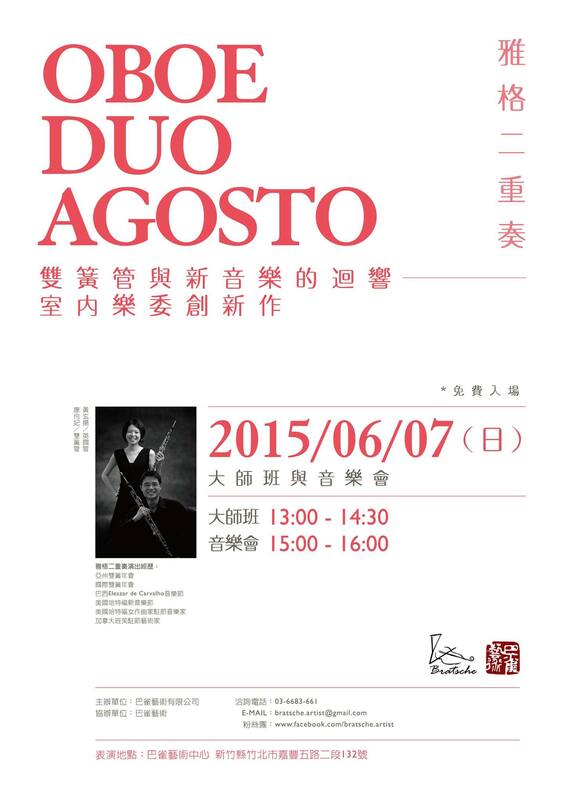 Oboe Duo Agosto will also give a masterclass before the concert at 1pm on the same day and in the same venue. Please come to the concert for the 13th performance of my Phantasy, and support the very wonderful Oboe Duo Agosto. Thank you very much! Phantasy for oboe and English horn will get its 12th performance tonight. It is also the first performance of this piece in 2014. 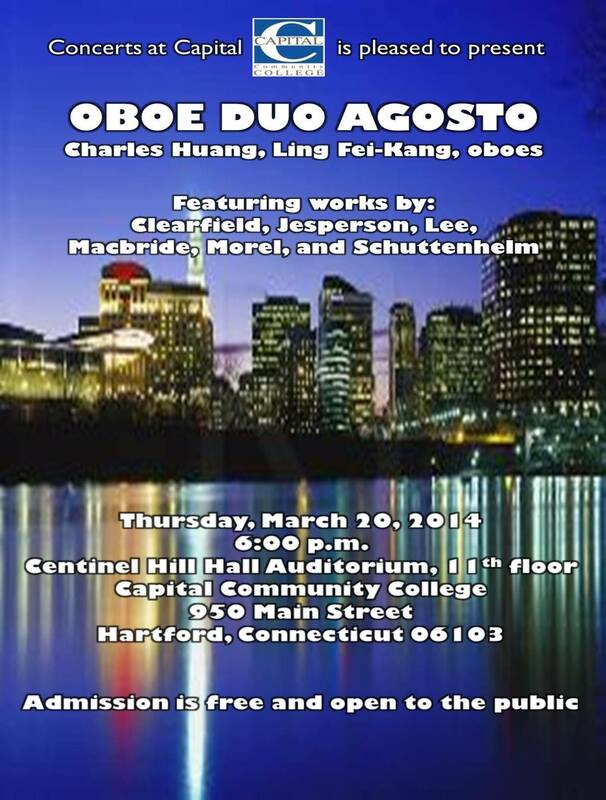 Please come tonight and support me and Oboe Duo Agosto (Charles Huang and Ling-Fei Kang). Admission is free. Thank you! My Phantasy for oboe and English horn, commissioned by Oboe Duo Agosto, will have its eighth and ninth performances in November. 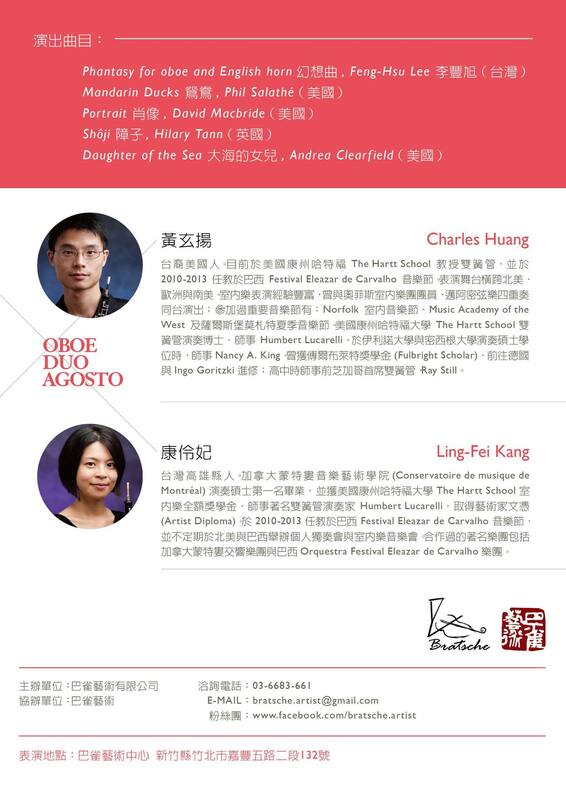 I am excited to have short trips with Oboe Duo Agosto for attending these two concerts. The eighth performance of Phantasy will be at the Danbury Public Library (170 Main Street, Danbury, CT 06810) on November 4 (tomorrow! at 2pm). 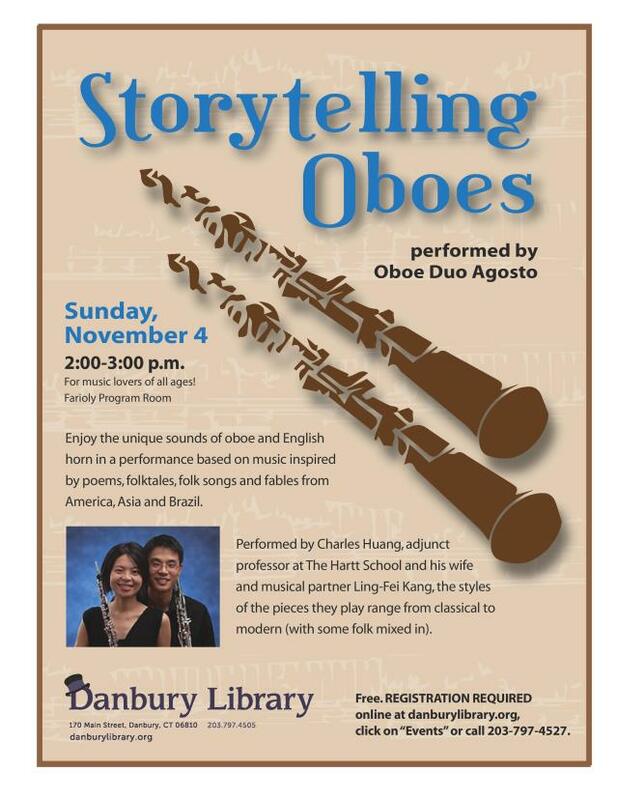 Free admission, but registration required online at danburylibrary.org. 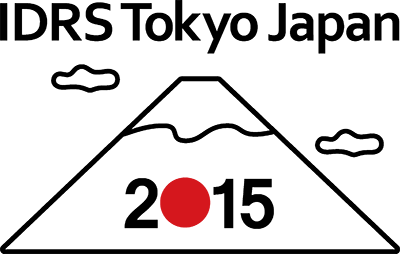 The ninth performance of Phantasy will be at Old St. Andrew’s Episcopal Church (59 Tariffville Road, Bloomfield, CT 06002) on November 16 (7pm). Ticket can be purchased for $10 each by emailing osatickets@gmail.com or by calling (860) 653-7441 (I think it can purchase tickets at the church on the concert day). For more information, please visit www.oldstandrews.net. For the program notes and recording, please click this link, “Phantasy“. There are two performances of my pieces on March 29, but in different states of the United States. I am looking forward to both concerts. First, Oboe Duo Agosto will perform my Phantasy again in the morning (10:55am). The concert will take place at the Hubbard Music Center Performing Hall of Loomis Chaffee School (Windsor, CT) and is open to the public. It will be the sixth performance of this piece. Second, saxophonist Po-Fang Chang will premiere my Cave Railroad for solo alto saxophone in the night (8pm) at his Master of Music degree recital. The concert will take place at the Bryan Recital Hall, College of Musical Arts, Bowling Green State University, OH. I will take the Amtrak from Hartford, CT to Bowling Green, OH (long trip!) for the premiere of my solo alto saxophone piece. Please click the “Performance” page for the direction of the venues, and both concerts are free admission. I have received a studio recording from Oboe Duo Agosto yesterday. The recording is my piece Phantasy, which is a commissioned piece by them as well. The studio recording was made in Arlington Heights, IL in December 2011. As result, I upload this recording to the “Phantasy” page. Please click this link, “Phantasy,” to listen to this recording and program notes of this piece. Also, please visit the page of Oboe Duo Agosto, “New Sound Clip,” to read the further information of this recording. By the way, Phantasy will get its fifth performance at the Prosser Public Library (Bloomfield, CT) on February 10, 2012.